Erin Fitzhugh Gregory is a Mobile, AL native who now resides in Columbus, GA with her husband Tim and their two daughters, McCall and Lizzie. Ever since graduating from Auburn University in 2000 with a BFA in painting, Erin has made her love of art a full-time career. While selling her paintings in several galleries in Alabama and Georgia, she also spends much of her time doing commissioned work and has done several book-illustrating projects. In addition to creating art, Erin enjoys teaching oil painting workshops. 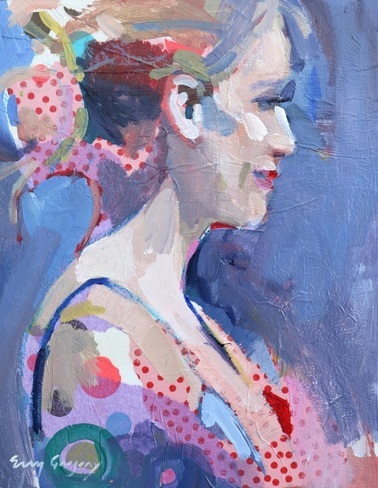 Erin's passion for painting is reflected in her rich and colorful landscapes, still-lifes, and figurative paintings. Her objective is to capture the contrasting nature of sunlight and shadow and to bring it to life with vivid color and brushwork. Erin has received numerous awards for her art and has been featured in various regional magazines. Since 2001, she has had several solo shows and her paintings have been featured in multiple exhibitions around the Southeast.